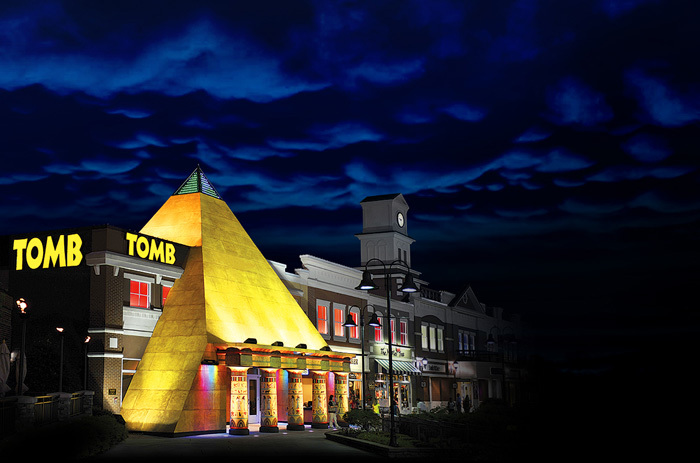 The TOMB is an interactive expedition deep into an ancient Egyptian tomb for 45 minutes of excitement. Your group (about 16 people) will find themselves trapped by the spirit of an ancient Pharaoh and face challenges. To make it out your group must work together to complete the tasks or face the Pharaoh’s wrath! This adventure has mixed reviews. http://www.tripadvisor.com/Attraction_Review-g55270-d2156658-Reviews-or10-Tomb_Egyptian_Adventure-Pigeon_Forge_Tennessee.html#REVIEWS The most complaints are about the short length of time for the money. It seems to be geared toward 8 – 15 yr olds. This entry was posted in Attractions and tagged Africa, Ancient, Ancient Egypt, Egypt, History, Pharaoh, Pigeon Forge Tennessee, TOMB, Tutankhamun. Bookmark the permalink.